When victory by the Allied Forces in World War II was assured, President E. O. Holland retired. 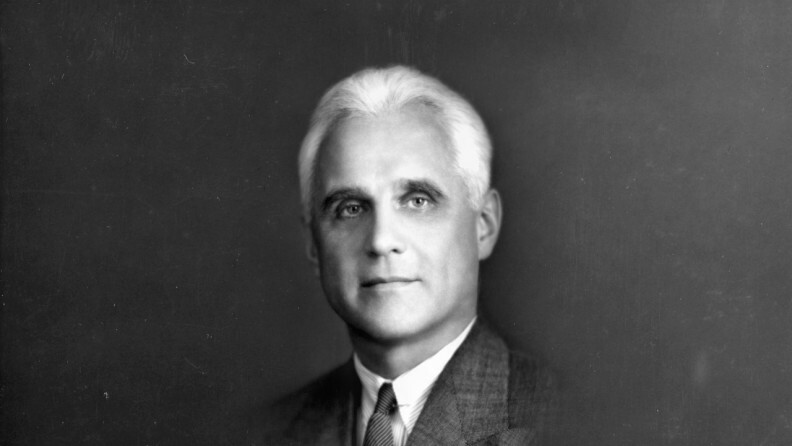 On August 21, 1944, the Board of Regents named Wilson M. Compton, an administrator and lobbyist for the lumber industry in Washington, D.C., as the college’s next president. Compton was born in Wooster, Ohio, on October 15, 1890. He attended the College of Wooster and earned a Ph.D. in economics from Princeton University as well as a law degree. He was a professor of economics at Dartmouth for a year early in his career. He came from a family with strong academic affiliations. His father Elias was a professor and dean at the College of Wooster. His brothers, both physicists, were academic leaders. Karl Compton was president of the Massachusetts Institute of Technology while Arthur Compton was chancellor of Washington University in St. Louis. Early actions included appointment of 40 faculty members to thoroughly review the college’s academic programs and administrative support services. Recommendations ranged from equalizing teaching loads to allow faculty time for research and scholarly work to freeing students from the need to declare a major as freshmen to establishing modern budgeting and fiscal systems. With the support of the regents and legislative funding, Compton created an Institute of Agricultural Sciences and an Institute of Technology to provide coordinated service to the state’s industries. He envisioned expansion of instruction to Spokane at locations being decommissioned by the military, first the army’s Baxter General Hospital and then Fort George Wright, but neither idea came to fruition. Instead, Compton led a period of substantial growth on the Pullman campus as many veterans used GI Bill benefits to attend college. In 1946, for the first time, WSC imposed admissions requirements to limit enrollment, allowing Washington and Alaska students to enroll with a 2.0 or higher grade point average, while students from other states needed a 2.75 gpa. The Compton years saw creation of the College Senate, a first Faculty Manual, and establishment by the faculty of general education requirements in the humanities, social sciences, and natural sciences for all students, as well as honors at graduation. Student advising services were also improved. However, in April of 1951, in the midst of difficult financial times due to state budget cuts, the Board of Regents ended the Compton presidency. At Homecoming in 1952, the Student Union Building was dedicated in his name, becoming the Compton Union Building or CUB.